I calculated some orbitals and I get quite strange results with orbital geometries I wouldn't expect from MO theory. A more experienced colleague just said: "That's always the case with big basis sets, just ignore those and search for the ones that make sense" which is a very unsatisfying answer and he couldn't explain what's the cause or what they mean. I also noticed that these occur more often/with lower energy when using HF but they also occur using DFT. Can anyone explain what happens here and why? Here is one example with the first two looking like I would expec. 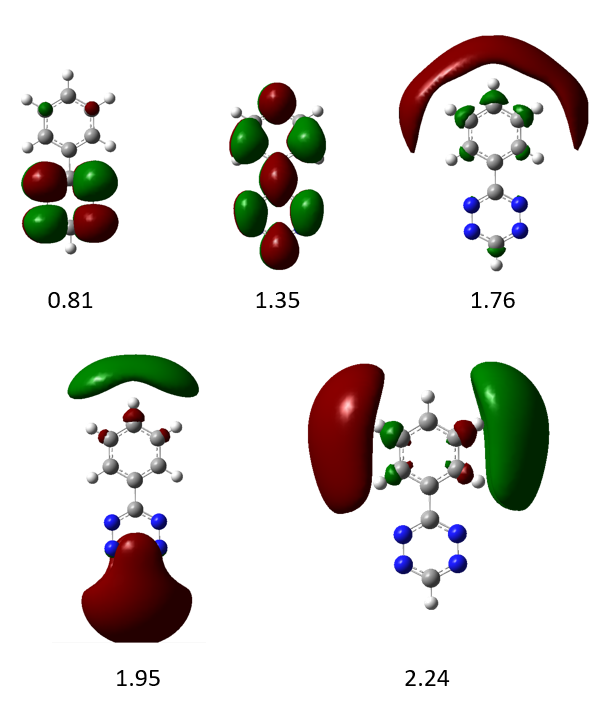 As already mentioned in the comments you have to be careful when interpreting the meaning of the virtual orbitals in a ab-initio or DFT calculation. In the calculation the only orbitals that are optimized are the occupied orbitals while the virtual (unoccupied) orbitals give you a guess of the shape you expect from them if they were occupied. To look at it from a simple perspective, somehow you are using the LCAO method, you obtain as many MO as AO you are using in your basis set, but you only optimize the MO that are occupied. There is a second point that may be relevant to your question. In many programs the default orbitals you get in your calculation are the canonical orbitals (delocalized orbitals) that even if occupied may not have an evident chemical interpretation on its own. For those porpouses it may be better to use localized orbitals (e.g. NBO) that may be easier to interpret. C. J. Cramer, Essentials of Computational Chemistry. Theories and Models, Wiley (2004). In addition to PAEP's answer, I want to shed some light on how much meaning virtual orbitals may have. First of all, there is the whole discussion on whether orbital in general are meaningful or not. Without going into details here: they are an approximation and as such they may give meaningful interpretations occasionally. If those interpretations do not reflect reality, we need to go to more sophisticated theories. Why do we even have virtual orbitals? What happens during the HF algorithm is, that we iteratively optimize the MOs based on the current (approximate) wave function (or electron density, if that helps imagining it). In HF this corresponds to the Slater-determinant, which is constructed from all occupied MOs. So all MOs (occupied and virtual) are optimized, but the optimization is with respect to the occupied MOs only. Another perspective would be to say that the occupied MOs are coupled together via the electron-electron interaction. Thus they somehow need to "work together" to minimize the ground state energy. The virtual orbitals however, do not contribute to that energy and are not coupled by the electron-electron interaction (because they are empty). Maybe one could say, that the virtual orbitals are not optimized with respect to each other. But maybe this statement does not really make sense, since due to the missing coupling there is nothing they could be optimized for. However, they are still valid eigenfunctions of the Fock operator and are therefore part of the orthonormal basis set of molecular orbitals. So there is something well defined about virtual orbitals which may justify interpretations based on them. But this is more vague/not as rigid as for occupied orbitals. Therefore a meaningful interpretation of virtual orbitals may not work as well as for occupied orbitals (and even those are limited). Not the answer you're looking for? Browse other questions tagged molecular-orbital-theory orbitals theoretical-chemistry density-functional-theory or ask your own question. Are there any full worked examples of DFT calculations? Why are correlation consistent basis sets used with DFT calculations? Orbitals SPDF. Why they named like that?